$41.91 NOTE: Our shopping cart is disabled. We are using it to display affiliate items which if you click on PURCHASE in the PRODUCT INFORMATION by scrolling below or click on the Amazon banner the RRDi receives a small affiliate fee upon completion of your purchase. Mahalo. Patented formulation with 4-Terpineol, the key ingredient of tea tree oil. Safe and effective. Cliradex is the #1 doctor recommended solution for ocular hygiene and dry, irritated eyes. Anti-inflammatory and miticidal. Kill Demodex mites. 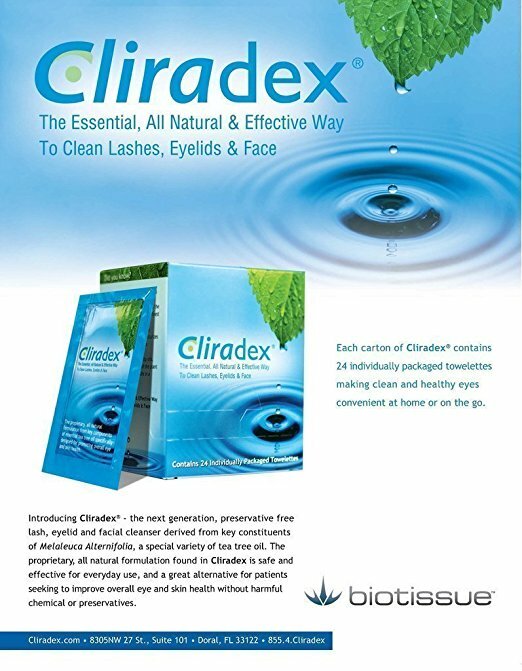 Cliradex, a preservative-free, all natural lid, lash, and facial cleanser with 4-Terpineol (derived from Tee Trea Oil), is a game changer in your management of blepharitis, Demodex, dry eye and rosacea. As is, Tee Trea Oil could be harsh, especially on the face. Cliradex is the only commercially available product that isolates 4-Terpineol, the active ingredient of Tea Tree Oil. The patented and proprietary solution is a natural way to keep your eyelids and skin clean, comfortable and healthy. Backed by science: Cliradex is scientifically shown to be safe and effective to control lid margin diseases. The effectiveness of Cliradex formulation has been published in over a dozen peer-reviewed papers and studies. How Much Do I Need? Cliradex is intended to be used once or twice daily. Your needs may vary based upon your condition. Consult your eye care provider if needed.